Green Living Thrifty Frog: Bottled Water ~ Problem or Solution? Bottled water has been on my mind for the last week or so. Every time I reach for a bottle of water I think about the effect it has on our environment. I am bothered. I am spoiled by the convenience. I tell myself I am okay because I recycle them. But am I really doing the best thing? I consider the trash cans in the park, the debris left behind by the illegal border crossers in our county, the blue recycle bins at our houses. It is a huge problem to wrap our heads around. Less than half of the bottles are recycled. The ones that are recycled are repurposed into carpet, clothing and such, which is a very good thing. The rest pollute our landfills and lie there forever. Some people are proponents of these expensive drink bottles and tell us we should be using them instead of plastic. Are they really healthier? Are they handier when traveling or on a picnic? At work? On a walk? What about all of the good that is done by Aid organizations during disasters? They hand out thousands or millions of bottles of water to those who have none. What about those who stockpile for our own emergencies when water may not be available for days or weeks. Don't we need bottle water? So much to consider. 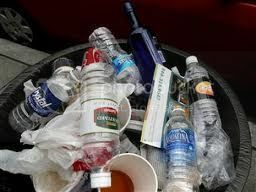 My own thoughts lean toward using bottled water, but making sure I recycle them when I am done. If I can repurpose them myself, all the better. I refill them several times. I use them to water hanging plants. I put some of my homemade cleaners in them. We store extra water in preparation for emergencies. We have two dogs and ourselves who would need to stay hydrated. We live in the high desert where it is very dry, with humidity in the single digits much of the year. Water is important. We carry it with us whenever we go outside, in the car, and traveling. It is safe. It is convenient. Do you use bottled water? If not, what is your alternative. bottled water is very important out here in the desert, and those expensive metal containers do come in handy if something were to happen while out hiking, it could be used to boil water to make it safe for drinking in case a person got stuck out in the wild, that being said, i also take plenty of plastic bottles too, and dare not throw one away til after the hike. Kevin - Thanks for adding your thoughts, especially about the metal containers. I am not as familiar with them, so am glad to have the input! I used to buy bottled water until I started to read about the toxins in plastic bottles. From what I can tell, no one knows exactly when they begin to break down and leach harmful toxins. I've read that freezing the bottle will do it and that washing it in warm water can do it. It's all so "iffy" and that makes me nervous. My other concern is that plastic water bottles are never truly recycled ... in other words, they are never recycled into the same product (water bottle). The best that can happen to them is that they are used to make a totally different item (benches, reusable bags, etc.). The problem with this is that the requirement for new bottles hasn't been reduced at all so we continue to use virgin materials to make them. While reusing is always preferable to tossing something in a landfill, reducing the number of new items in our environment is still best. I'm really not sure how to handle emergency needs. I know that there are filters on the market but that implies that there is some water available to filter. Water bottles may be appropriate for emergency needs ... I really don't know. I personally use stainless steel bottles. I love them! We keep 2 filled in the refrigerator and take them with us whenever we leave the house. They are easy to wash and fill. We have one which is insulated ... we haven't tried it for anything hot yet but it does keep out ice water cold for a long time. Thank you for this post ... it really made me think! :-) So glad you linked up in our Meet & Greet ... I'm looking forward to reading more on your blog. Thanks for the wonderful comment! It is evident you have given a lot of thought to this. We need to get some of those stainless steel bottles and do the same as you. 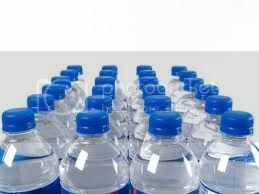 We do buy bottled water, but the idea is to have it on hand if for some reason the would be a water shortage. You are welcome here anytime. I hope you will follow so you can chime in on other topics! I will be there! It does sound fun! Thank you for inviting me! I watched the video...yes, it is very interesting! I don't know of any place in our part of AZ that recycles hard plastic. This would be a good thing! Thanks!